If you’re a fan of waterfalls, spring time in Yosemite is right up your alley. Yosemite Falls, Bridal Veil fall and the rest of the icons are booming. Throughout the rest of the park there are dozens of ephemeral falls, many without names. 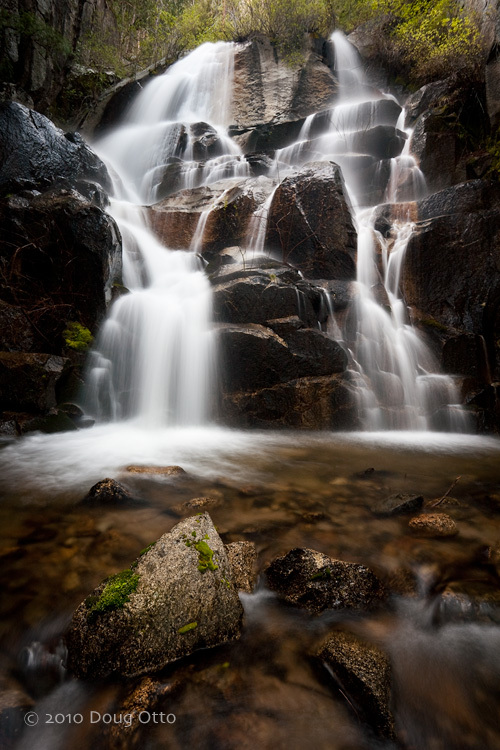 Little more than a stain on the granite during much of the year, these little falls can be a real treat in spring. This ephemeral fall is large enough that it actually carries a name: Wildcat Falls. It drops total distance of 630 feet in several steps. Just west of the Cascades, the upper portion of the falls is visible from the road. There is also an unmarked turnout on the road and short trail takes you to the shady base of the falls seen here. Composing this scene presented a couple of problems that had to be addressed. While the base of the falls was in shade, the rock face and foliage above the falls was very brightly lit. I collapsed the legs of my tripod putting my camera position only about 18″ from the surface of the stream. It was at this moment that I discovered the other problem. The cable on my remote shutter release is 24″ long. After blowing and shaking enough water out of my remote to make it work again I start composing the shot. Solving the brightness issue was simple, just exclude that portion from the frame. With the camera very low, I used my Canon 17-40 at it’s widest to exaggerate the perspective. I tried a number of angles until finally deciding on this composition with the rock in the foreground. It’s a simple element but it really strengthens the composition. I set aperture to f/11 to provide ample depth of field, adjusted my polarizer to take the reflection off of the water and took the shot. This fall will most likely be gone by my next trip to the valley so I’ll have to wait until next spring to photograph it again. This entry was posted in Photography and tagged Canon 17-40, Canon 5D, doug otto, Photography, Spring, wide angle, wildcat falls, yosemite, yosemite national park. Bookmark the permalink. Love the shot and info on the falls. Thanks for sharing this. No problem Jim, thanks for the comment.